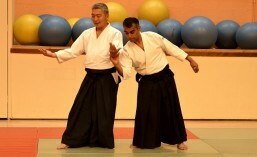 A review of Doshu Yoshigasaki’s new book, All of Aikido, has been written on the British Ki Society website. His previous book, Inner Voyage of a Stranger is also available. He will be in London on Friday 19th June to teach a class to our London club followed by a weekend Seminar in Salisbury. If you would like more information about the course or either book please contact us by completing the form below.